Thursday night we had a thunder storm. Ever since we moved to the eastern shore, I've heard of a place called Calvert Cliffs where hunting for shark's teeth is easier after a storm. This has been on my list of places to go with Zack since forever, and both of us have been looking forward to doing this for ages, so Friday, armed with grubby tennis shoes and a backpack, off we drove. ... only to see the last parking space get taken. We'd driven an hour and a half to this place and there was literally NO other place to park anywhere CLOSE to this place. I saw Zack's worried face in the rear view mirror and I told him that I believed when things like this happened, there was a very good reason. For instance, maybe we didn't have all the right equipment. We forgot a bucket, and a sieve, so would he be ok if we turned around and checked out the nearby town of Chesapeake Beach? 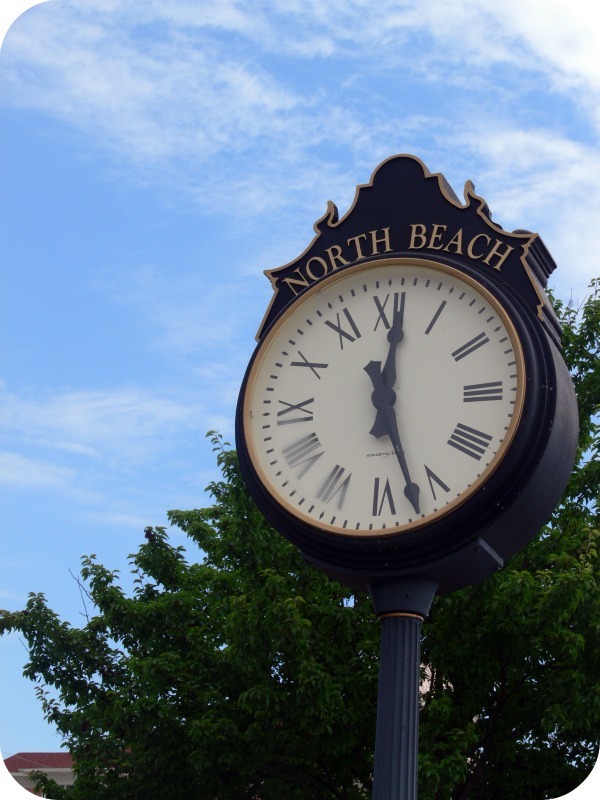 Fortunately, the word "beach" was the operative word, and we drove a few miles to the quaint town. The boardwalk was awesome. Zack was all for walking along but got very upset when he saw a plastic bottle someone had hurled over the side. Much to the amusement and enjoyment of a lady passing by, he loudly proclaimed the dangers to the environment this caused and how horrible he thought it was that people were so careless. Last year his second grade class helped clean up the riverbank in a nearby town, so I'm glad to know he learned a lot and it stuck. Past that pier, there was a small beach. Zack wanted to play, so I looked for a way down, only to find out I had to pay to play. That's fine, ok, sure. Good thing I still had some cash left over from Bead and Button (which is actually miraculous) because it cost us $16 to go to the beach. I suppose they had to charge because they get no funding for the upkeep of the beach, and it was really, really clean (minus the one and only bottle Zack saw) so I can't really complain. We had a wonderful time. Zack spent a lot of time digging. 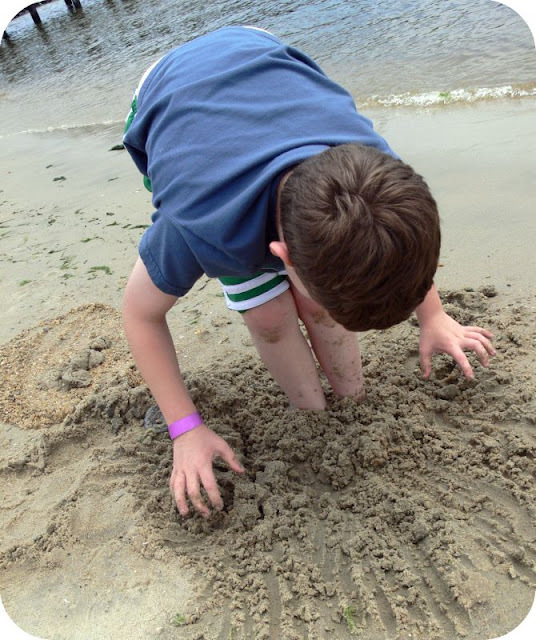 When I asked him what he was digging for, he looked up and calmly said, "Just digging." It DID seem really calming, and I think we all could use some beach time just to dig in wet sand. We didn't find any shark's teeth, but we did find some sea glass, a sparkly rock, two neat pieces of wood, and a piece of pottery. We accidentally dropped a bunch between the cracks of the pier when we were shaking the sand out of our shoes, but we still came home with a nice handful. All in all, it was a great Adventure Day, and I was extremely proud of Zack for rolling with the punches and going with the flow when things didn't turn out like we'd planned. He hates when things don't go by the book, so for him to be able to adapt and adjust that quickly and easily made me proud. Which leads to the lesson I learned from that. I'm a LOT like Zack -- I don't like it when plans change or kinks in the system throw me out of whack. I like things to be orderly. I like it when I know that what I have planned WILL and CAN be done. But lately -- it just hasn't been happening. But if my eight-year old can handle a disappointment with a smile, so can I. And who knows. Maybe I'll find treasures along the way. I love that otter in the wall with Zack. Lori, what a great day you had with your son, and what wonderful memories for both of you!!! You were made for each other! What a wonderful walk on the beach. Wonderful pictures, and a great story! Hi Lori, your son Zack is a very engaging young man, he reminds me so much of my Jack oh do i miss those times with him although you do get fishing in quite often throughout the summer he is going to be 16 in October i hope he never get's to old to wanna hang out with MOM once in a while. As for you Little Missy your creations (at least five) i counted in the latest issue of "easy wire" are "abso fabu" is there no end to your creativity then i was looking though the Feb issue of "beads and beyond" and low and behold there you are on page "66" giving a shout out to the "Art Bead Scene Blog",idk how i missed that all the times i looked through, i tend to go right to all the creations and then when i have time read the articles LOL. My Renee get's a kick out of me when i get my Mags now i'm like omg "that's my friend and that's my friend" she thinks it's so funny. It seems we could all take a lesson from Zack...myself included here recently. I'm thankful you posted you this tonight. All in all it sounds like you both had a wonderful day! Happy Sunday to your family and Dad! Yes, we can all learn a lesson from Zack. I know I get a bit moody when things don't go as planned. My husband would say "a BIT moody"???? No, a LOT moody. So Zack, thanks for teaching us all a lesson. I know the feeling of wanting things going as planned, and then not happening that way, but with a smile anything seems better(even when is not). I have really enjoyed reading your post. We have so much to learn from our little ones. I understand...I like to have plans, too, but sometimes they just don't work. It's nice when the alternatives work out so well! And what boy doesn't like burying his feet in the sand? Both my boys did. 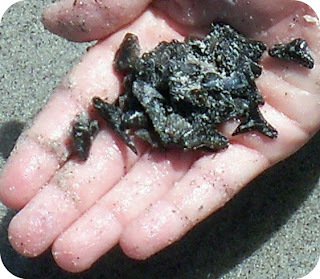 Boy I miss those lazy days beach combing with little ones, well medium little ones anyway. What a trooper Zack is. I will be thinking about his positive attitude while I get through my own funk too. Wish I was that close to the ocean- I miss it terribly. Lovely pictures....especially the 3rd and 4th ones!!! The shots looks soo casual that You can collage and frame the in remembrance of the wonderful time you had together !!! Wish I were like Zach... I hate change of plans... especially when it comes to travel...!!! Lovely post! Such a sweet day with your son. There's so much to learn from an eight-year old! Life is so much simpler. Thanks for the reminder Zack! Lori, you've got one very special little boy! It is amazing how much the little ones teach us - and such a surprise at times. Making memories! You are a good Mom! Beautiful pictures Lori. Zack has the right idea. 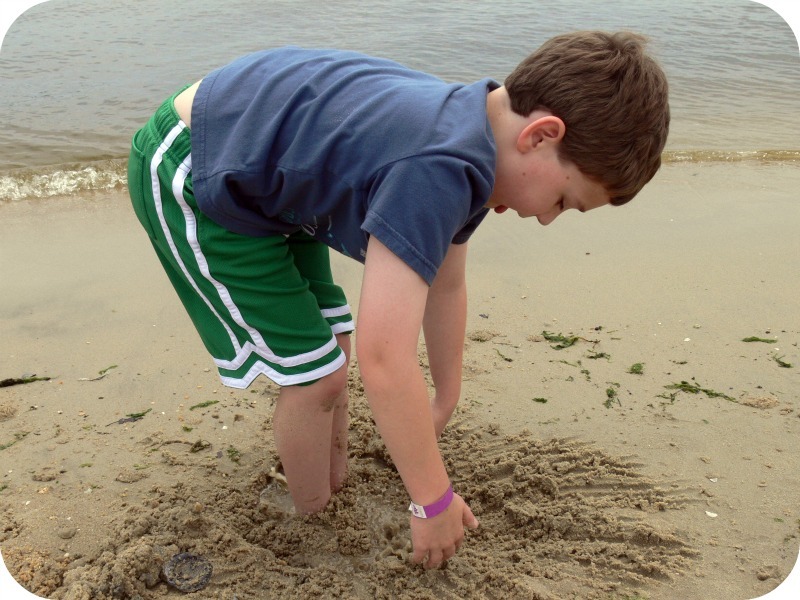 I agree that we could all use some time digging in the sand. That picture of Zack with wall otter is amazing! Glad you all had fun :-). What a wonderful day you both had, I used to be very similar to you both, i used to get so disappointed when things did not go according to plan, in fact i used to feel that niggling bubble of stress i get when i feel i'm losing control of a situation. But i had to let this go, this past year as my life is so crazy now, i've learned never to plan in advance, i live day to day, and when people ask me what i'm doing i two weeks time, i now reply with a simple 'i don't think that far ahead'. It has really helped me in my quest to not sweat the small stuff, although i still need to work on other areas ha ha. Great little beach collection you guys found! Kudos to zach for rolling with the punches. I am forever asking my son to go with the flow, but, he is very organized and when something is planned, or he thinks it should be a certain way, there seems to be no other option to him (I belive its called ridgid thinking). He also had a lot of sensitivities as a child. SO its nice to hear about Zach, and his acomplishments. Thanks so much for sharing. It amazes me my guys can dig in the sand for hours making tunnels and towers! It is very relaxing and thereputic for them - a pile of sand and some water and they are happy! I am glad your plans worked out after all! 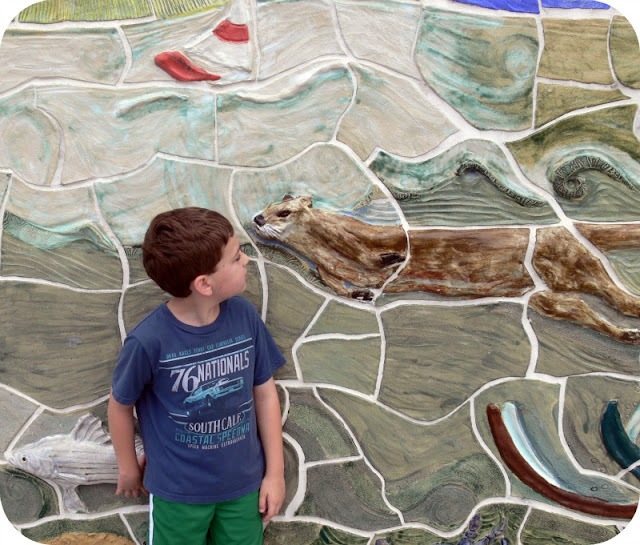 There is a place that brings wonderful fossils in called Edisto Beach that we used to visit when my son was young. We were members of the gem and mineral club in our town. There was always a field trip almost every month to neat places where everyone hunted for gems and minerals etc. Some of my best memories with my son! 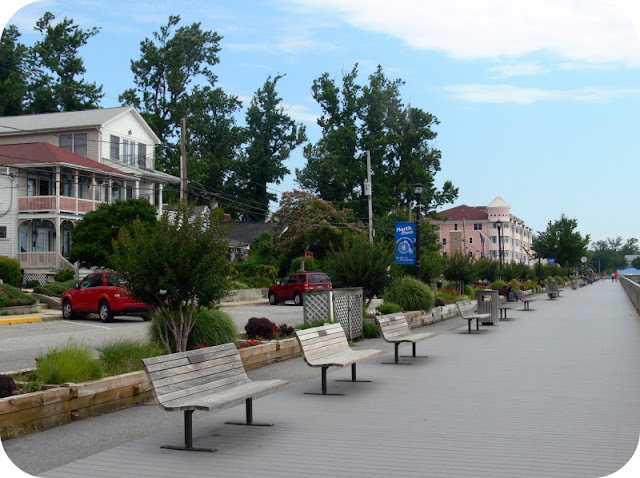 I love Calvert County Maryland, it is one of my favorite places in the U.S. For your next outing you might want to consider the next county down and to the west- St. Mary's, where there is a very large Amish community. Not much for a tourist, but if you make it to the local farmer's markets you will wonder why every farmer's market doesn't sell goats, rabbits, lambs, homemade pies, breads, etc... I think at the tip of St. Mary's County there is a marine museum. But isn't it fabulous when kids surprise you? I think that it's so amazing that Zack rolled with the punches. I, too, don't like it when things don't go according to plan. But if anything about this stupid, month-long computer issue has taught me is to be flexible. Wow, excuse my ignorance but I had no idea 'sea glass' really came from the ocean! That is really neat. Now I have a new found appreciation for it. Are you and Zach going to make a creation out of them? I think it would be really cool to start collecting them and then make a beautiufl mosaic of some kind. But alas I live in Arizona and not near a beach, lol. Let me just get this out of my system... 16 bucks? 16 actual, real bucks, not sand dollars or anything? *insert barrage of swear words here* That is just naughty, I'm sorry. Now, for the truckload of good bits. Not only is your son immensely handsome, he also seems to have a keen eye for detail. Not too many peeps would have spotted that offensive bottle, and even though I agree that it is a crime against mother nature, I might not even have spotted it myself. Obviously, all I know is what I see in those bright spotlights you shine on little moments of your life with Zack (and his life with you), but from what I gather, that kid is not bound to be a great man, he already IS. Maybe it is the way you write it up, but I am pretty certain that if it wasn't for his personality, no writing skills on earth could create such a captivating, inspiring soul as his. Thanks, Zack, for another new motto of mine. I love the treasures you found! I think I would jump around laughing and screaming if I found sea glass. I often see it on Etsy (made into pretty necklaces and earrings) and I think it is SO cool! I hear you on wanting things to go as planned. I guess we can learn a lesson from the children and roll with the punches. 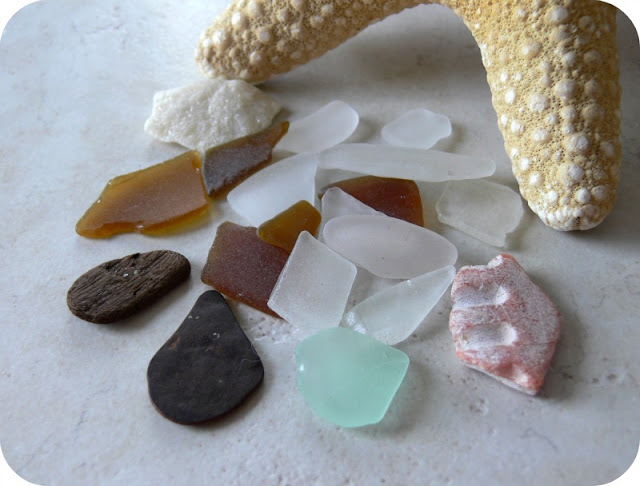 I love beach glass--it would be so fun to find my own stash!! How wonderful to spend the day at the beach together. I just returned from spending a couple of days at the Outer Banks with my daughter, it was wonderful. Just the two of us (oh and her dog), of course she is a bit older, 22 and in grad school at UNCG. Looks like you turned that day around beautifully! 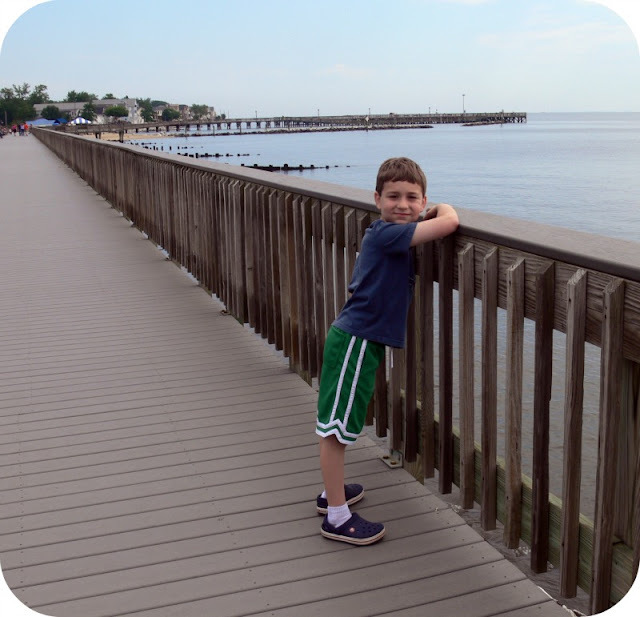 I would recommend trying Calvert Cliffs again though - Jackson and I go there often and we've camped there with Cub Scouts as well. We LOVE it! The hike from the parking lot to the beach is so interesting with deciduous forest, marshlands and finally the beach! The tire playground is awesome too! Seems like the two of you had a pretty awesome day. Smiles! And brought home treasures too? Now that's a really, really good day. In life, so much doesn't go as we plannned. I try to remind myself that when everything goes perfectly, somehow we don't have as good of stories to tell.